I love the outdoors so a safari nursery theme was just perfect for my baby boy, Elijah. I also have a deep love for animals of all kinds and my hope is that the design of this room will encourage my son to develop the same love and appreciation for animals that I have. That is just one of the reasons that I chose to feature so many in large sizes in the space. I decided to do something unique and different and painted the walls beige, the ceiling blue and use shades of green as accent colors. 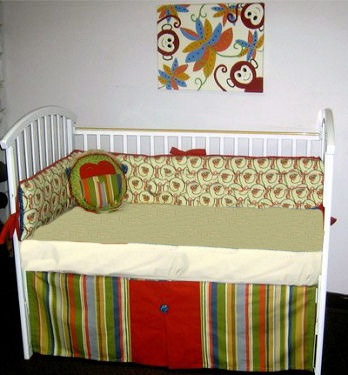 Unlike most walls painted for a jungle themed room, you will not see a green painted wall at all in Elijah's room. One of my favorites in the many jungle features of the space was to use glow in the dark paint to paint galaxies of stars on the vaulted ceiling. Then I draped yards of loosely woven burlap fabric to give the feeling of camping inside a tent in the jungle. The glow of the painted stars shines right through the burlap and gives the safari nursery theme a lot of atmosphere and personality. I painted blades grass directly above the wooden floor molding. I traced and painted the silhouettes of mother and baby animals for my baby boy's jungle nursery using a safari animals stencil pattern that I bought online. I painted shadow boxes and crates jungle green and used them as shelves to display cute little jungle animals. Elijah's safari nursery room took about four months to complete. I see that a lot of moms and dads that visit Unique Baby Gear Ideas love this style of decorating as much as I do and I hope that they find some inspiration in my pictures. I think that the giant stenciled animals on the wall are just awesome. I would like to do something similar using more paint colors. Thanks for the ideas and for sharing your pictures! Hello, the animals I got from Rosenberry rooms. The kit uses carbon paper. You tape it up and trace the outline of the animals then you fill in with any color paint you choose. The Tree, I am not sure if you are talking about the big leaf or the twigs in the of corner. The leaf I got from Ikea and the twigs I got from Michaels craft store. Hope this helps! :) thanks for all the compliments on the room. I really loved putting it together. 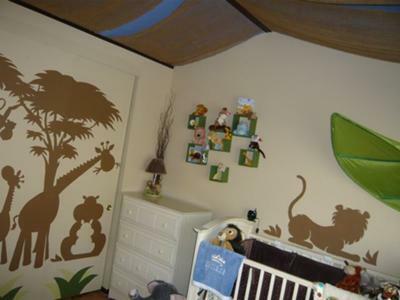 Could you please tell me where you found the adorable brown baby animal silhouette stencil/wall decals? Your room is absolutely beautiful, feels very fun, yet peaceful. Love the room and the appreciate the time you put into it. Where did you get the fake tall tree in the right side of this picture? I've seen this before and I love it! I would love to have one like it if you would please email me and tell me where you found it! Join in and write your own page! It's easy to do. How? Simply click here to return to SAFARI NURSERY IDEAS.